From 27 August 2015 until 1 February 2016 the Committee called for written submissions. They received more than 21,000 unique submissions – a record number on any issue at that time. These are published at Parliament’s website. From 24 August 2016 to March 2017 the Committee heard about 800 oral submissions over 108 hours, after inviting all 1800 people to speak who indicated that they wished to do so. The Committee released their report on 4 August 2017, concluding that 80% of submissions were opposed to euthanasia and ‘assisted dying’ (assisted suicide). The report is an easy-to-read summary of what they heard from submitters. The Committee did not make any recommendation that the law should be changed. Read the NZ Herald article by Simon O’Connor: Why we didn’t back euthanasia bill. 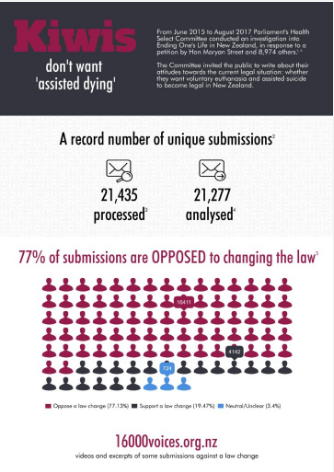 A random analysis based on a sample found that 78% of submissions are opposed to changing the law on assisted dying (assisted suicide and voluntary euthanasia). The website, 16000Voices.org.nz, showcases some of these submissions. The Care Alliance analysed all the published submissions and found that 77.1% (16,411) were opposed to euthanasia and assisted suicide; 19.5 % (4,142) supported euthanasia and assisted suicide; and 3.4 % (724) were neutral or unclear on this issue. They also analysed the length of each submission and whether religious arguments are used. 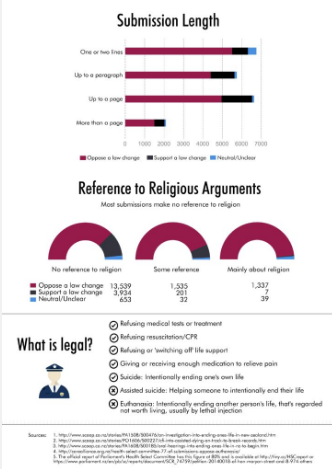 The submissions opposing euthanasia and assisted suicide dominated each length category and 64% of submissions made no mention of religion. The infographic on this page is based on this analysis. Read our media release about the results. The attitudes of New Zealanders towards the ending of one’s life and the current legal situation. The Committee intended to consider “all the various aspects of the issue, including the social, legal, medical, cultural, financial, ethical and philosophical implications”. Here is an interview with Simon O’ Connor MP, the Chair of the Health Select Committee at that time, about the scope of the investigation.